Sounds like the Minister is trying to deny the unions their right to strike and take other industrial action, doesn’t it?This is an outright fabrication. Minister Fahy is in no way trying to prevent any of the island’s unions from taking industrial action. Minister Fahy has simply asked the courts to make sure that unions follow the law and rules they have agreed to – notice must be given before industrial action takes place so that attempts can be made to resolve a dispute and avoid workers walking off the job. We cannot afford the practice of the past whereby a meeting is called by a union, generally in the middle of a work day and workers decide to down tools then and there. How many Bermudian children, seniors and parents have been left stranded by these strikes? These illegal actions not only inconvenience the public who rely on those services but they also waste public money the economy cannot afford to lose. Such actions not only deny the public’s expectations that they will receive the services they, as tax-payers, pay for – but also damages our international reputation and jeopardises foreign investment in Bermuda. This only serves to hurt the very people the unions claim to represent. The unions and People’s Campaign would have the public believe that the Government is, in Mr. Furbert’s own words, using “Draconian measures” to “undermine the right of freedom of assembly.” That’s just more misinformation and disinformation – we have no intention of undermining anything protected by the Constitution. There has also been much talk about the 1981 general strike and ‘shutting the island down’ if the unions don’t get their way. The OBA Government and the people of Bermuda should consider the consequences of such schoolyard bully threats. The big losers in a general strike are always those who can least afford to lose – ordinary Mr. and Ms. Bermuda. It’s also difficult to determine exactly what the unions are so up in arms about. Is it the court injunction to make sure the unions follow the law and their own agreements? Is it the defamation suit against the Bermuda Public Services Union President? Or is it simply their desperate need for the Opposition to get back in power at any cost? We in the OBA Government are doing everything we can to stimulate our economy and attract foreign investment which will provide jobs and opportunities for Bermudians. This is no easy task given that Government has been running annual deficits since 2009, deficits that have created the unsustainable debt we now face. As we try to fix the economy and cut costs, not a single civil servant, all of whom are members of a union, has been made redundant. The furlough days, which helped the Government save more than $40 million have ended at the insistence of the unions. So exactly what the unions are hoping to achieve by ‘shutting the island down’ is difficult to pin down. Shutting the island down won’t erase our debt. It won’t help balance our budget. It certainly won’t help get our economy back on track and put Bermudians back to work. 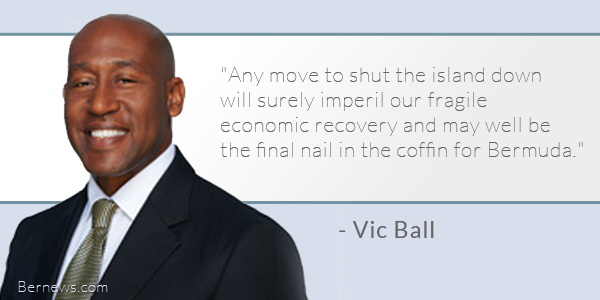 Any move to shut the island down will surely imperil our fragile economic recovery and may well be the final nail in the coffin for Bermuda. I urge the union leadership to work with the Government and the private sector to solve the problems faced by all Bermudians – black and white, rich and poor, young and old, union member and non-union member. This is the simple request of Bermudians. Our only hope is that we all work together so that we can solve our problems. But it must be done with mutual respect, following the rule of law and in the absence of threats like the one the BIU leader made on Labour Day. How come OBAers are eloquent letter writers, but can hardly put a thought together on the floor. Very simple ! Because they debate best to themselves , in their own heads , while sitting on the toilet . I find myself on the toilet after Coffee . Not surprising , most OBA’ers have weak constitutions . Anything good will be rejected automatically . No!!! We only have weak constitutions to those that continue to spew daily diarrhea from those such as yourself!!!!! Says the Real Bermudian who cheered when the Republicans withdrew the US NAVAL bases from Bermuda !! whatever you say there Juan Baldedz . Well said and to the point. I just hope others will understand what is being done via the Courts. Those that don’t are the ones who rely on the unions, PC and PLP to tell them what is happening. It does not take a rocket scientist to figure out the unions and peoples campaign agenda?? They simply will bring the Island to a stand still if that is what it will take to get the plp back into power!!! And why not??? After all the BIU received big gifts when the plp were in power, such as that $10 million forgiveness of the bond they owed!!! This is just more proof that the plp/unions always puts themselves over all else!!! Mr Ball quit correctly points out, ” it is always mr and Mrs. Bermuda that suffers the most ” when the combined opposition pulls their unlawful stunts, and in particular it is their own supporters that suffer by far the most!!!! All correct thinking Bermudians should be kicking themselves in the behind for not protesting and marching on the cabinet building when the incompetent plp gave the BIU that gift!!! The unions have proven they can’t be trusted and breaking the law means nothing to them!!!! A lie spreads quicker and gains more likes from people who live , think and operate like you ! lol, Coffee… but you have to note; a certain BIU insider admitted the agreement was with a certain Premier at the time and holds NO water now under the OBA. Now that’s some BS thinking there my friend. Why would LaVerne have started the “lie”? She, of all people, would have known the inside truth. What happened, did she slip up and let the story out? The PLP bailed out the Bank of Butterfield… don’t see them fighting tooth and nail to get the PLP back in power. Ok, so the PLP gave the Union gifts, that’s what friends do. UBP have been giving their friends gifts as long as a Government was formed on this island, is BTA a gift. PLP were just playing catch up. Gifts???? Guess that’s one way to word it. Thanks for the clarification. Oh boy–get ready I hear the spin machine whirring into action—one big belch of vitriol getting ready to puff out of the machine!!! Just follow the law folks how hard is that–REALLY…. just want to know the pop spokesmen of the week???? So the Busses that are not running every day is that not costing money to our people that need to get home? When they only fine out the same day and time that the bus is not running? We must stand up for our rights and get knock down for our ignorance. Right now America’s Cup is MORE important than a few cancelled buses. people complain because the OBA don’t communicate about what they are doing, and people complain that the OBA is grand standing with opinion columns communicating what they are doing… seriously… pick one, can’t have them both. Unions represent a tiny minority of our workers, managers and staff. I for one am completely sick of them. No wonder they are shrinking with this sort of radical selfish attitude. And this tiny minority has a lot of punch, you saw what happened in the beginning of the year when SpongeBob wrote that threatening letter. Just another case of misinformation. Ooopsy. Vic, you are a massive disappointment, shame on you ! Yeah but not like an $800 million disappointment. The OBA has more than doubled that debt. Thats also the PLPs fault. Myth, but yes, that is the PLP’s fault. Definitely. It was $1.6bn or so in December 2012. It hasn’t doubled, despite the efforts of unions to force government to spend every last borrowed cent. Typical, lets get the Black guy to validate our dirt. The 800 is not debt, it is missing and unaccounted for. Completely different. Although personally, I don’t have the same concern for the 800 as I don’t think it is stolen but simply an example of complete ineptitude by the civil servants, many of those in accounting positions have almost zero accounting qualifications. AG chambers are qualified folks but those in the individual departments are often administrative staff who have been given responsibility that is beyond them. If only PATI could let us know when the last fiscal audit of a government department was done by an independent investigator. I would be shocked if there has been one in the last 15 years at least, prob longer. Well I wasn’t even talking about the debt but since you brought it up…..yes it is the PLP’s fault. The OBA inherited that whopping $1.2 billion debt that the PLP created and yes the OBA had tomorrow something ridiculous to keep it at bay or else the Bermuda Government would have defaulted. I don’t know why people can’t understand that simple idea. It’s kind of like if you have hole in your roof during a hurricane. You try to patch it up best you can while the storm is still raging. Well guess what? That extra billion of debt that the OBA had to borrow is that patch. Thanks PLP. Thanks a lot. Lol lol Vic !!! If the Oba practices what they preach we’d probably be able to somewhat believe you ! Lol !! Your gang has two mouths on every face ! I believe it your vision is ” Fuzzy ” too !! If some one would have told you that a government would come into being that would have worst labour relations with Bermuda’s labour movement than that which existed under the old UBP government; it would not have been believed. Clearly this government has no understanding of the deep roots the labour unions have in the community and as such no government could really isolate it and any widespread confrontation would open up Bermuda to widespread civil unrest. As one who stood on one of the many picket lines of the labour struggle of 1981; I am keenly aware at one point where such an open ended labour unrest would reach the point of no return. It would be at that point that Bermuda would find itself of having not enough prisons to contain the fall out. my my it sure does get under alot of peoples skin.They really do not like an honest and straitforward information.All they can do is to DEMAGOUGE it. but manny of us do appreciate you putting pen to paper as a very few dont seem to know what either is. No we just don’t like Surrogate’s that are being used to under mind what his forefathers fought for. Open Mind you are spot on! I already donate to a worthy charity. PALS is one charity that is totally worthy of my contribution. Ask any cancer patients who cares for them during this difficult need. The unions are politically motivated and no longer represent work related issues. Wake up union members….if you want job security you must fight for a thriving economy. Can the unions or plp or pc move this island forward? Credibility and ethics are necessary and these groups lack both! Then let the charities negotiate and write out an agreement for them and let them denounce ALL the benefits they receive from the UNIONS. Do you work for the union Onion Juice? Do you work for UBP? Repeating the party line in an opinion column is not helpful to anyone other than the party faithful. What the government is attempting to do is to ask the courts to stop illegal striking BEFORE it happens which is impossible. If the Unions take an illegal action then the courts can be asked to force them to honour the terms of an agreement but what the Minister has asked is for the courts to ban the unions from taking Future actions which is impossible. The court is already available to both sides in any dispute if the other side is not following the rules so please mister Ball explain exactly how your minister’s plan will work? What is so wrong with the aimed policy of “notice must be given before industrial action takes place so that attempts can be made to resolve a dispute and avoid workers walking off the job”? Why is this a deal-breaker for unionized workers? You’re ticked off at either the employer or government, fine. But why take it out on the general public with the wildcat activity? Giving notice would probably get more allies to your cause. Even two days could serve to escalate the seriousness of the issue to all parties, and allow the public to prepare for disruption in service a little better.